Pro Dive Plettenberg Bay, Garden Route. The ultimate marine animal encounter – a safe, fun activity for the whole family! Get up close and personal to these friendly and playful marine animals in their natural environment. They are inquisitive animals, happy to show off their acrobatic skills, swimming effortlessly and gracefully through the water. It is bound to be one of your most interactive and exciting experiences ever! This activity takes approximately 1.5 hours. 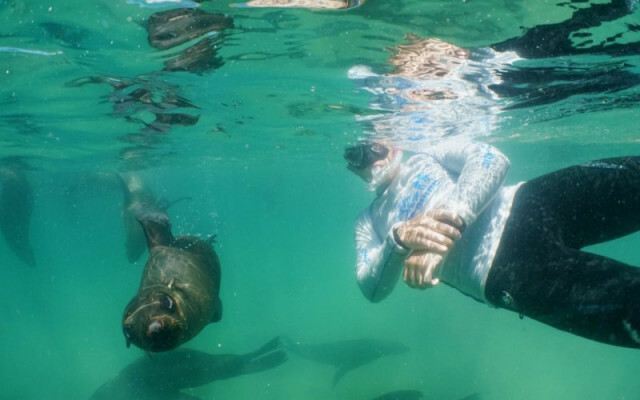 The Seal Colony is situated on the Robberg Nature Reserve, only a 10-minute boat ride from the beach.